The Ultra Breeze Vent Cover allows you to keep your vents open in the rain and the exclusive patent-pending airfoil technology allows for up to 75% more airflow than competing products. 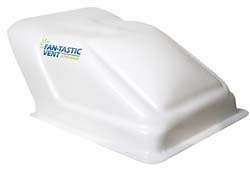 Field-tested to provide superior protection for vents while allowing between 95-100% airflow, the highest of any vent cover! 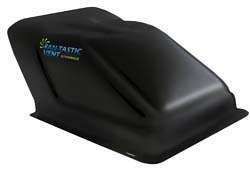 Made of high density polyethylene with UV protection, they fit over most 14" x 14" roof vents and high-powered ventilators. Hardware included. 3 year limited warranty. 26"L x 19"W x 9.5"H.
The Smoke Version is made of CAB (Cellulose Acetate Butyrate) and is transparent, therby allowing the most light penetration of any of the Ultra Breeze covers. See video below for air flow comparison of Fantastic Ultra Breeze with various other vent covers.